Our comfortable, well equipped self catering cottages offer the ideal holiday location for a family holiday or for couples looking for a short break in North Cornwall. Quiet and peaceful, yet just 4 miles from the A30 and within easy reach of the north Cornwall coast with its spectacular coastal walks and popular surfing and family beaches. We don't charge for your dogs. 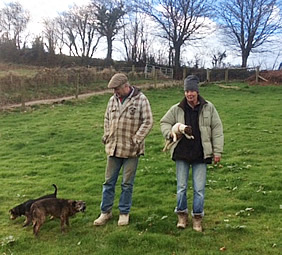 All three cottages have individual day kennels, hot dog showers and secure exercise areas so everyone can have a relaxing holiday. Keeper's Cottage and Groom's Cottage are attached barn conversions, each with 2 bedrooms on the ground floor and a kitchen/diner/lounge on the first floor. The holiday cottages are furnished to a high standard and each cottage has a balcony with views over the surrounding countryside, the lake, the exercise area and the farm. The Bailiff's House sleeps 6 and is a detached self contained single storey house with 3 bedrooms, sitting in its own large enclosed garden with ample off road parking. As lifelong dog owners who take their dogs on holiday, we welcome dogs. We understand what a dog and its owners need on holiday. Our holiday accommodation is designed so that your dogs enjoy their holiday as much as the rest of the family. 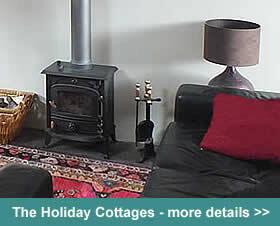 Each cottage has a day kennel and a dog shower. There is a fenced exercise area to the front of Groom's Cottage and Keeper's Cottage extending to about an acre with a shallow lake. Both cottage balconies overlook these and dogs can run free whilst being exercised. In addition each cottage has a yard so you can leave the cottage door open and not worry about your dog. Bailiff's House has a half acre of lawned fenced garden for the sole use of its guests. This together with its large kennel and dog shower makes it suitable for 4 to 6 dogs depending on size. Keepers and Grooms are suitable for 2 to 3 dogs depending on size. We provide identity tags, dog towels and throws. Higher Tregawne lies at the head of the lovely Ruthern Valley and its land runs up to 600ft at its highest point from which there are magnificent views over Padstow, the Camel Estuary, Brae Hill, Rough Tor and Brown Willy on Bodmin Moor. Here you are far from the madding crowds. On clear nights the stars shine brightly as there is virtually no light pollution. 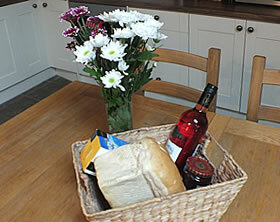 On arrival you will find a welcome basket of local fresh bread, jam, Cornish shortbread, wine and flowers. 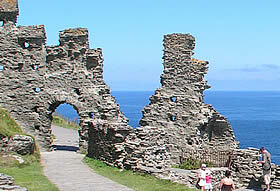 Guests seeking a relaxing short break or a few quiet days away out of season are very welcome. The north coast surfing and family beaches of Polzeath, Rock and Daymer Bay at Trebetherick are all within 10 miles of Higher Tregawne. The fishing harbour of Padstow famous for Rick Stein's seafood restaurant, Paul Ainsworth's Number 6 and numerous other restaurants, Port Isaac where the TV series Doc Martin is filmed, the charming unspoilt fishing cove of Boscastle, Tintagel and Newquay with its sandy beaches, Newquay Zoo and Blue Reef Aquarium are all within easy reach. Cornwall has much to offer both in and out of season and what better base to explore it from than one of our cosy cottages at Higher Tregawne!